I've been peeling tomatoes with simple blanching for years, but I've never once given a thought to the skins that slide off. Cuisine Queen Gabrielle Hamilton transforms hers into a fancy tomato powder, but Food 52 has tweaked her method to make a tomato-flavoured salt that is fresh, fragrant and easy on the eyes. Check out the link below for more detailed instructions, but the process is pretty simple; all you need is equal masses of tomato skin and sodium chloride. Coat the (hopefully pesticide-free) skins with some coarse crystals and bake at 90C until they're dry and crispy. 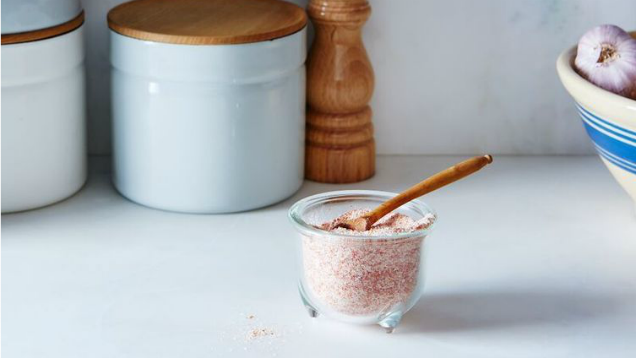 Once cool, pulverise it all to make a pretty pink powder. Sprinkle on everything with wild abandon.